Home » Sponsored » Yard Work = Allergy Face? Not Anymore! Yard Work = Allergy Face? Not Anymore! Have you been following our giant yard project this summer? We trimmed back that hedge, removed a hydrangea, put in a lot of pea gravel, built some screening fences (yay, hidden garbage bins! ), and a few other major projects. So, with all that yard work (grass cutting, anyone? ), I find myself the frequent victim of Allergy Face! Living in the delightful Willamette Valley of Oregon, and next to an open hay field and just down the street from an apple orchard, I often fall victim to the watery eyes and nose, itchy throat, and cough of allergies. I suffered through allergy season for a long time, until I discovered relief in the form of allergy medicine! Specifically, ZYRTEC® helps relieve all those awful disruptive symptoms. Don't forget to watch the ALLERGY FACE™ video! It has three great beauty tips for working with Allergy Face while still following this season's hottest trends. Yes, there is such a thing as the hot new "wet eye" look! Still not convinced? Check out this infographic? I was so surprised to find out that 66% of women feel ugly or unattractive because of the effects of allergies on their face! Use a green concealer to camouflage redness. This works around the nose, especially! Then just cover with your skin-tone foundation. Use waterproof mascara just in case your eyes water! Keep your eyeshadow neutral and play up your lips instead during allergy season! 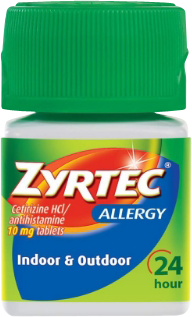 Don't forget to Check out Zyrtec on Facebook! Now it's your turn! What are your go-to tips for avoiding Allergy Face? …and here’s where I drop your RSS feed. Seriously, it isn’t even related to your blog topic. I don’t have a problem with people making money on their blogs. I don’t blame you for that a bit. But wasting my time and bandwidth to click on your ridiculously image-heavy and badly formatted blog-o-mercial? I’m done here. You only get that click once from me.